Here are the race results from last weekend. We are unable to race on Saturday because of rain, high winds and lightning. We held five races on Sunday in light winds from the north. There were major wind shifts during the regatta. The first two races, it paid off to go left and in the last three, going right. Very frustrating to anticipate these shifts since Sarasota Bay usually has few shifts more than 5 degrees. Bob Blomquist was most consistent in anticipating the shifts and raced with a couple from Canada that knew how to fly the asym. He dominated the regatta in his newly converted E-Scow which Bill Meissenheimer converted. Richard Elsishans raced his new converted E-Scow that was delivered a few days earlier from New Jersey. Ted Weihe was close with a third. The regatta was our first all asymmetrical E-Scow event. 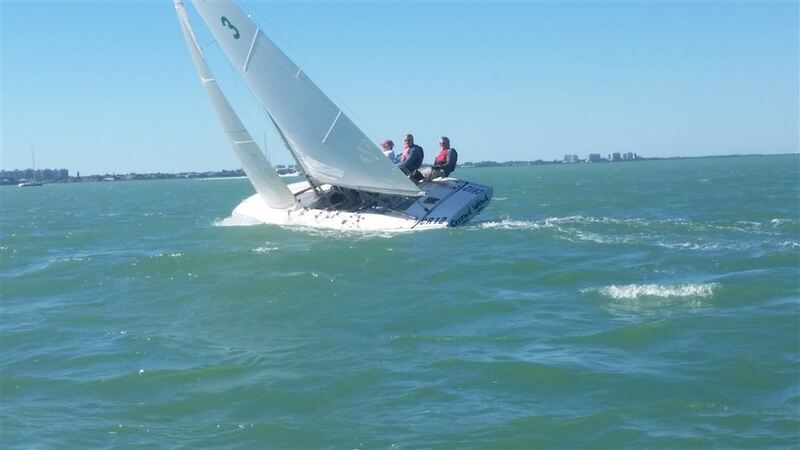 We hope to encourage the class to hold a mid-winter E-Scow regatta in conjunction with the SSS One Design Midwinters which take places on third weekend in March. SSS can guarantee wind. With other performance classes, we have held multiple regattas over several weekends so that you can traveler your boat and leave it here between events. Bob Cole just bought a winter home in Sarasota and along with Jeff Nicholas from Clear Lake, Iowa is ready to discuss holding the first major Mid-Winter E-Scow regatta next March 2017. We are probably the only E-Scow fleet that is built on Snowbirds from the Mid-West, and members buying winter homes to avoid the cold. We hold E Scow races every Wednesday afternoon (seven last Wednesday), and MC races every Friday afternoon during the winter months. We hold major regattas about twice a week. Thus, if you like to sail year around (and we race in evenings during the summer), Sarasota is the best scow place anywhere.